The Austin Air Pet Machine was designed especially for people with pet allergies. The filter in this air purifier was made to trap the allergen in pet dander. If you are allergic to pet dander this is the perfect machine for you. In addition to removing pet allergens it also removes other air pollution from your house. It gets rid of other allergens like smoke and pollen. It also removes germs, bacteria, mold spores, chemicals, odors, and other asthma triggers. It does all of this without producing any harmful by-products. The pet machine's filters last an incredible 5 years. They come with a 5 year pro-rated warranty. Here is what makes this machine so special. Look at these features. It can clean about 1500 square feet. It uses a long lasting 4 stage filter. It has 15 pounds of activated carbon. It has 60 square feet of medical grade HEPA. It has a 5 year pro-rated warranty on the air filter. Austin reports the coverage area of the pet machine as 1500 square feet. Almost no one has a room this size. If fact, many people's whole house is only 2000 square feet. This will clean any room in a normal house. The smaller the room the better job this machine will do. At the listed fan rating of 400 cubic feet a minute, it would clean the air in a 1500 square foot room two times an hour. The recommended minimum number of air exchanges is 4 an hour. 6 air exchanges an hour is better. The Austin Air Pet Machine can clean a room 750 square feet with 4 exchanges an hour. To get six you need a room 500 square feet. A 500 square foot room is still larger than most rooms in a normal size house. If you put this air purifier in a room this size you would get excellent filtration. The Pet Machine measures 23" high and it is 14.5" on each side. It is not very big, but it weighs a heavy 45 pounds. It has wheels. This will make it easier to move to different rooms. We don't consider this really portable. Especially if you plan to move it between up and downstairs. This is where the Austin Air purifiers stands apart from the competition. The Pet Machine uses a 4 stage filter. 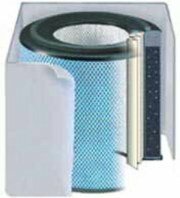 To find out more details of this filter read Austin air filters. The stage 1 and 2 pre-filters can be cleaned with a vacuum. You can do this without having to open the air purifier. Vacuum it once a month for best results. The stage 3 and stage 4 filters are one unit. They have a 5 year pro-rated warranty. You should expect to get 3 - 5 years of use out of the filter. You will get a discount if your Austin Air Pet Machine needs a new filter before 5 years. Here is the amount of the discount. 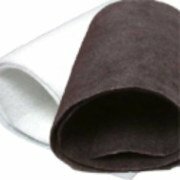 We think the combination carbon and HEPA filters have a drawback. They cannot be replaced separately. Even if only one filter needs replacing you will have to replace both. Most people will not be affected by this, but it is something to think about. A replacement pre-filter (stage 1 and 2) cost about $20 dollars when you buy it separately. It comes with a replacement filter. A replacement filter is about $230 dollars. It includes the pre-filter and the charcoal and HEPA filter. This may seem like a lot of money to pay for a replacement filter. These filters only have to be replaced every 5 years. Let's compare the cost of an Austin Air Pet Machine to another air purifier. To see a chart comparing the cost click here. These all combine to make this one of the best air filters for pet allergy suffers on the market today. The carbon and HEPA filter are combined. It weighs a hefty 45 pounds. Owners of Austin Air's Pet Machine have mostly positive things to say about it. Noticed a huge change in air quality immediately. It helped reduce stuffy nose and scratchy throats. It is noisy and the fan makes an annoying sound. It does nothing to remove the odors from the air. Can still see dander and dust in the air. 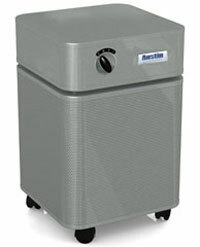 We think the Austin Air Pet Machine is a great air purifier. It does a great job filtering dander and other particles from the air. It will work great in a smaller room. We think in a room 500 - 600 square feet, it will do an amazing job of cleaning the air. We think you will find this machine does a great job for you as well. It will reduce you allergy symptoms and help you breathe better. It is big and heavy. If you plan on moving your air purifier around a lot, you might want to look for a smaller lighter one. We also really like this machine because it is low maintenance. Vacuum the outside once a month and change the filter every 5 years. The upkeep is super easy. You really can just turn it on and forget about it. We recommend this air purifier to everyone who suffers from a pet dander allergy. Leave Austin Air Pet Machine Page and Return to Austin Air Purifiers Page. Leave Austin Air Pet Machine Page and Return to All About Air Purifiers Home Page.